Whether it’s words or wood, it comes down to putting the pieces together in an artful and lasting way. For the first, I believe I know what I’m doing. These days I am getting schooled in the second. WORDS: It still amazes me that I can put one word in back of the other to build a sentence, then a paragraph, and finally, a story. Add characters, setting, and a conflict in a nice arc, and voila! I have a novel. Of course, it’s not as easy as that. 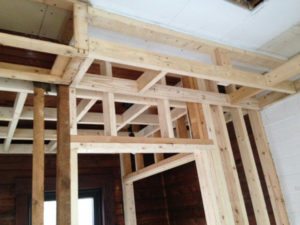 WOOD: Those who follow this blog are aware my husband, Hank, and I recently bought a bungalow on the Buckland side of Shelburne Falls in Western Massachusetts. It was built in 1900 — not very old to my friends in the United Kingdom — but old enough that it needs work given how many people have lived in it for 117 years. We’ve started the demo. Let me rephrase that. Hank’s started the demo. I haul away the stuff that’s useless to create a neat pile outside for when a roll-off container arrives. I hand tools and do a lot of cleaning. The other day, I covered the good floors with cardboard sheeting to protect them. I handle the paperwork. 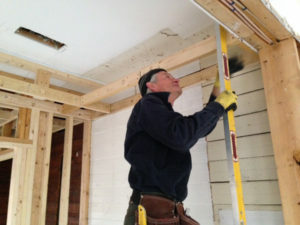 And I watch what Hank does with 2-by-4’s and plywood as the house’s interior gets rehabbed. (Actually, being married to a woodworker, I have acquired a knowledge of carpentry through osmosis and often include a carpenter in my novels.) But as the project progresses, I am seeing firsthand how it all works. I am also learning new terms such as sistering, jack and king studs, and top plates. Eventually the pieces — along with nails, screws, and Hank’s skills — will come together as our new home. By the way, Hank and I have an arrangement. I don’t touch his power tools and he does the same for my computer. It works for me. I like my fingers intact. SOCIAL MEDIA: Lastly, one other form of piecework. Besides keeping tabs via social media about what is happening in the world and with those close to me, it’s a way of spreading info about my books. Thanks to Crooked Cat Books, my mystery, Chasing the Case, will be published in May or June. I am already on FB, Twitter etc. but I’m upping the game in advance of the mystery’s launch. My goal is to have 500 likes by the end of December on my Facebook Author page: Facebook @JoanLivingstonAuthor. I have 150 to go. My other goal is to have 1,000 Twitter followers: https://twitter.com/JoanLivingston. I’ve made great progress, 701, as of this writing. Thank you to all who are likers and/or followers. If you aren’t one, I hope you will soon be. I promise not to be a pest. ABOUT THE PHOTO ABOVE: Hank hard at work in what will be the kitchen.